With a wide range of channel choices for retail customers, banks need to be aware of the usage and preferences for each channel which can vary for multiple reasons including the purpose of the transaction, complexity and where the person is from. On the digital channel, customers usually require a fast and convenient service such as simple transaction or checking an account balance, but for branch service, customers, especially affluent customers require tailored personal interactions such as loan servicing, investment advice, and other complex transactions. In self-service channels, Asian customers not only need a convenient and easy channel, but also a personalized interactive service to increase their loyalty to the bank as competition is rising and switching costs are lowering, especially in the wealth management space. These wealthier customers produce higher value for banks, and usually they have a wide range of choices on banking services. In Asia, affluent customers show greater loyalty to their banks, while in most European countries and the U.S., affluent customers have relatively lower loyalty to their banks. Thus, maintaining affluent customers is important for banks to generate higher revenues. Citi, one of the major players in Asia's wealth management space offers tailored services in Singapore. Their Citigold service provides a dedicated center for nonresident Indians. The personalized interaction improved the loyalty from their affluent customers because Citigold satisfied nonresident Indians’ special requirement on banking services. However, China is showing a significant gap between affluent and mass-market customers on loyalty because the affluent customers receive much better service from their bank than mass-market customers do. 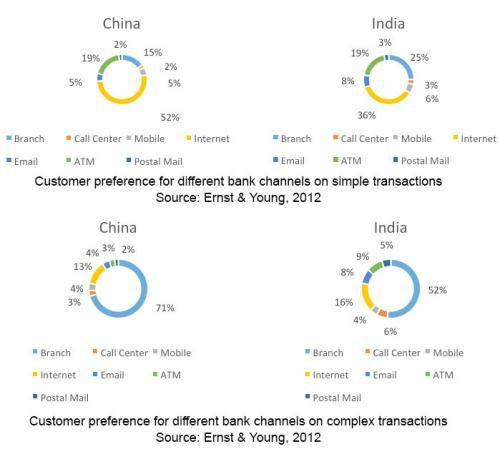 Banks should not only rely on channel innovation but also focus on improving service on the existing channels. Maintaining the existing affluent customers with tailored service is crucial to the bank since the affluent customers will continually show a high loyalty to their banks in Asia, but enhancing a required service or product for mass-market customers through different bank channels will also increase the overall customer loyalty.